I love St. Patrick’s Day! It’s one of my favorite holidays. 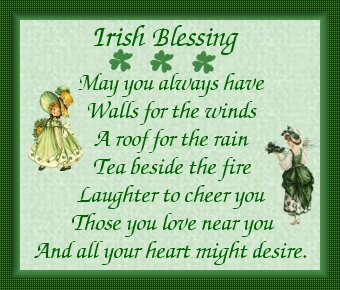 Now, I’m certainly not 100% Irish or even 50%, but along with English, Scottish, Welsh, French, and Cherokee, there are quite several Irish ancestors in our family’s heritage. My family usually celebrates by cooking either a traditional Irish breakfast or having an Irish-inspired dinner (usually a roast or bacon and cabbage, colcannon, soda bread, and Irish potato candy or a chocolate Guinness cake for dessert), Since I’m the cook and I’m not exactly in the mood to resist those really delicious dishes, we decided to skip it this year. I am wearing green, though, and we can still appreciate and remember not only Saint Patrick’s life, but also what our Irish ancestors went through both before and after arriving in America. So, Happy Saint Patrick’s Day! Previous post: A new recipe. Next post: National Poultry Day.